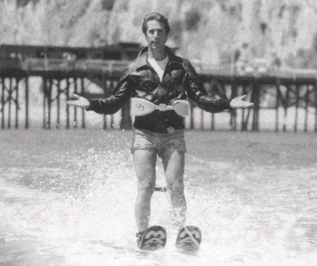 So the writer of the infamous Fonzie jumps the shark episode of "Happy Days," the one that gave the name to the Jump the Shark Web site and concept, is now speaking out in the L.A. Times. And...he doesn't really get it. He seems kind of mortified that his episode was the one chosen, and even though he says that people are thrilled when they find out he wrote it, he still seems so ashamed. Yes, it was a ludicrous concept, but we embraced its craziness and think of it fondly. The Jump the Shark concept is a little confusing anyway. The writer seems to think it means the show's low point, but really it means the point at which the show could go no higher, at which it was all downhill from there. I loved the idea of Jump the Shark when it came out a long time ago. It really summarized and pulled together a lot of the reasons why shows started to lose it, the most famous being adding a kid (Cousin Oliver, Olivia on "The Cosby Show"). But the creators sold the Web site to TV Guide in 2006 (I hope they made millions) and it's just not nearly the same now. I was the biggest "Happy Days" fan when I was a kid, and I distinctly remember the "jump the shark" episode. I was heartbroken that they would air something so lame, and I never watched the show again.